There really is an art to real flirting. I can't explain it but you either have it or you don't. Wrong. Apparently Ms. Rich reckons anyone can do it, or learn to do it. In my book, what she's describing is plain just being nice and not flirting at all. My dictionary's definition of flirt is: To court a person playfully or without serious intentions". I despise false flirts who come off as ditsy or an airhead. I deplore insincerity too. Personally, I find it so easy to just be nice to everyone, animals too. Animals like attention as well. So, what is it that Southern Women have that we don't? Read on. 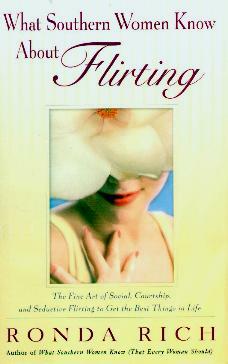 Her book covers: "Social Flirting, appropriate to use in any situation, including professional situations". I disagree - I couldn't imagine doing business with someone who flirts - I want someone with substance and backbone. And, if you're just nice, you'll get airline upgrades and hard-to-get restaurant reservations she says you can get by flirting. Why demean yourself? Anyway, "flirting" in the workplace leads to all sorts of stupid trouble. Don't be lazy - do stuff yourself. Flirting this way becomes tiresome because if you're always looking for someone else to do your stuff, you'll quickly become a bore to others and they'll start avoiding you - we've all got enough of our own stuff to take care of. The next two, "Courtship Flirting" (your flirting might get him but will he find it "cute" after a while?, and, I wouldn't want a man as shallow as one who would fall for flirting) and "Seductive Flirting" - Rich says, "From the first date to the celebration of your fiftieth wedding anniversay, dress in the way that appeals to him, even when it takes more effort". I thought society had moved way beyond this behaviour decades ago - does this mean you can't be yourself and wear whatever you like? It's what's inside (men eventually get this) that's so attractive. Rich is saying you can get what you want by flirting - I don't agree with this. This kind of flirting comes across as bribery - I don't do bribes, thank you. Just being a good and honest and friendly person will encourage others to treat you the same. I couldn't live with myself if I had to be sickly sweet and bat my eyelids for attention. Just be yourself and people will sense you are real. Visit Ms. Rich's website at www.southernallure.com. It's much harder to say no to a nice person than it is to a mean one", says Rich. Exactly, so why would you have to "flirt"? After I read her Flirt Alert on page 32: "Short skirts can create shortcuts to problem solving", I put the book down. The day I have to shrink to this level and degrade myself, you can shoot me, please. Conclusion - Probably the most "behind-the-times" book I've come across - we women have advanced so much more to revert to this.